Shunichi Takayanagi recently sent me a copy of the Japanese edition of Frye’s The Double Vision, translated by Takashi Eda (Tokyo: Shinkyo Shuppansha, 2012), 172 pp. 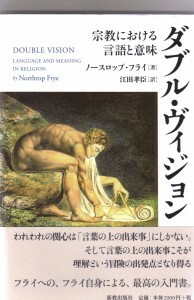 This is the seventeenth translation of one of Frye’s books into Japanese, including a revised translation of A Natural Perspective. Altogether, Frye’s books have been translated into twenty-five languages. The Italians lead the list with eighteen. The Chinese and French have each translaterd eleven of Frye’s books; the Koreans, ten. This entry was posted in Uncategorized on January 4, 2013 by Bob Denham.